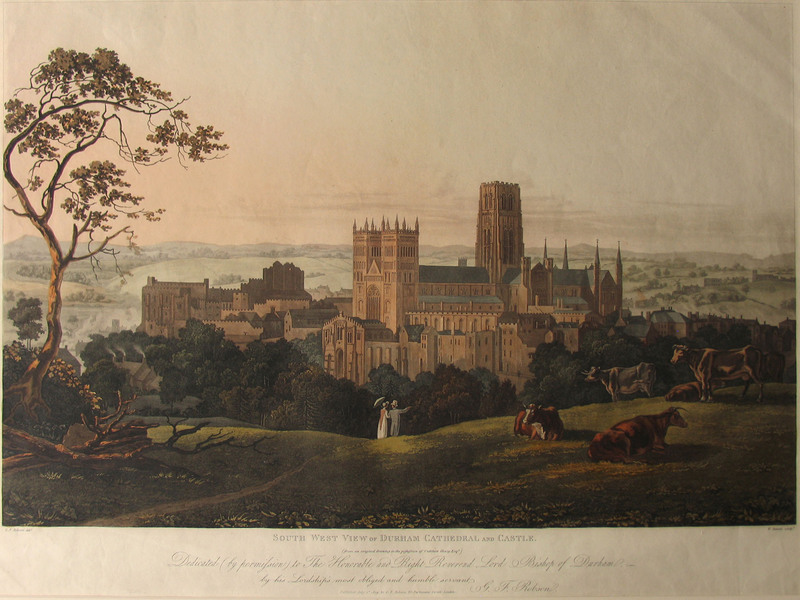 South-West View of Durham Cathedral and Castle. Drawn by G F Robson, engraved by W. Bennet. Published by G F Robson, 25 Parliament Street, London, July 1st 1809. Dedicated to the Honourable and Right Reverend Lord Bishop of Durham. The South View of the Castle being the Bishops Palace. Drawn and engraved by Samuel & Nathaniel Buck. 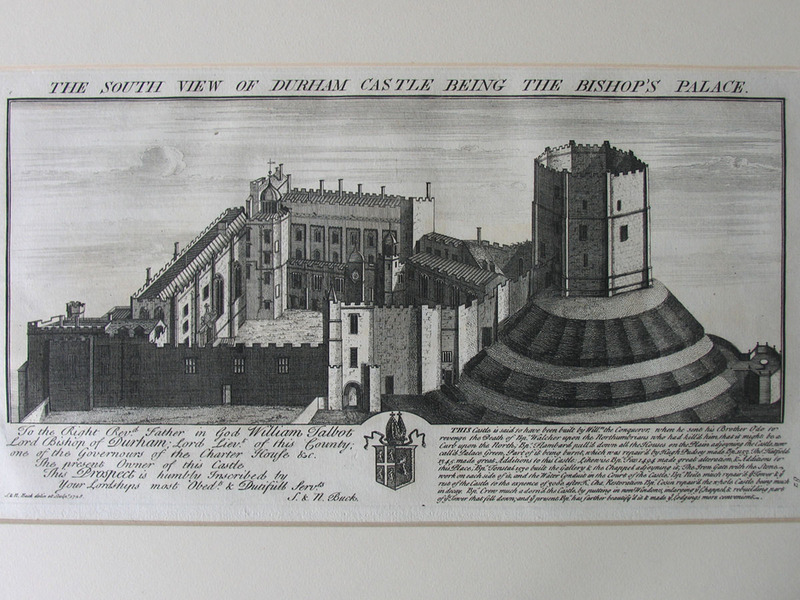 Published 1745, Garden Court, No. 1 Middle Temple London. 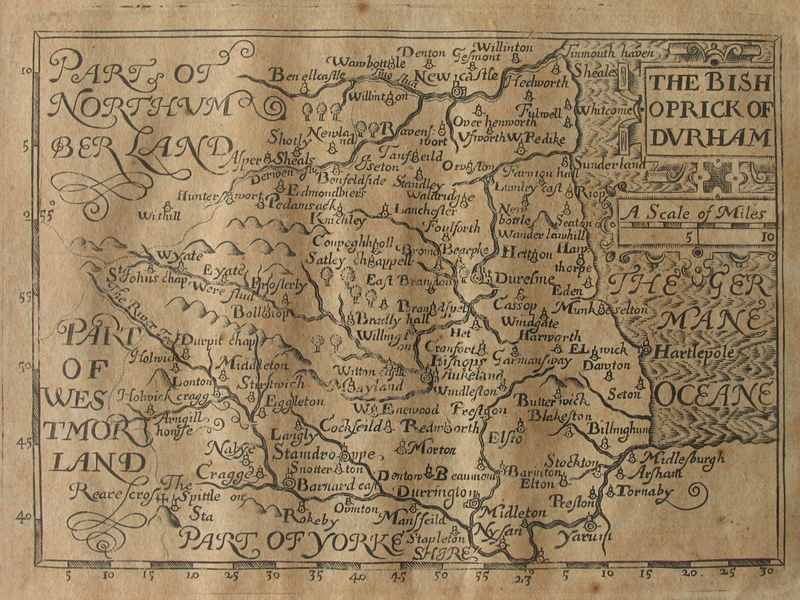 Saxton/William Web 1642 – from “The Maps of all the Shires of England and Wales 1645”. The original Saxton map of 1576 has been updated. The Arms on the right are changed from Elizabeth to Charles I and the cartouche on the left is also amended. John Bill 1626 from “The abridgement of Camden’s Britannia with the Maps of the severall Shires of England and Wales”. The first series of county maps to show longitude based on Mercator’s prime meridian through the Azores. Michael Drayton 1622. “Poly-Olbion or a Chorographicall Description, The Second Part, or Continuance”. 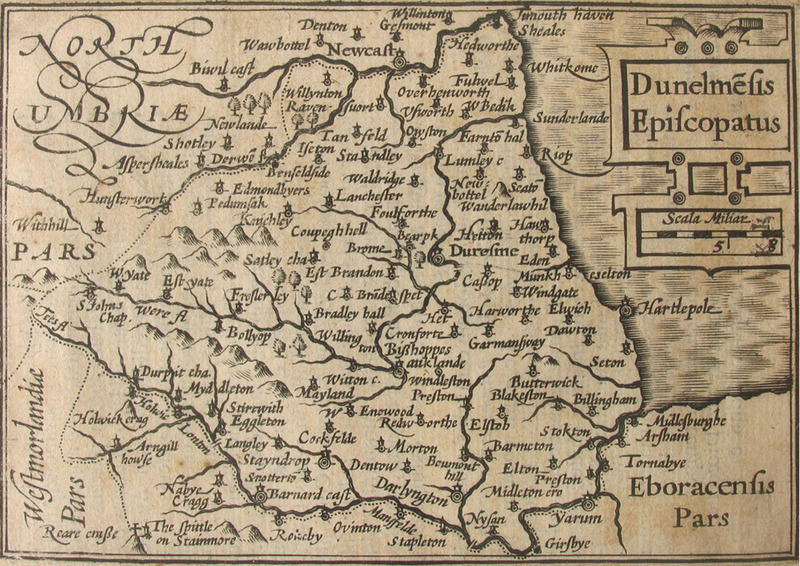 Durham and Northumberland, page 151, was published with a description in the Continuance, being an expanded publication of the 1612/13 issues with the addition of the northern counties. Pieter Goos 1666. “Zee-Atlas ofte Water-Wereld”. 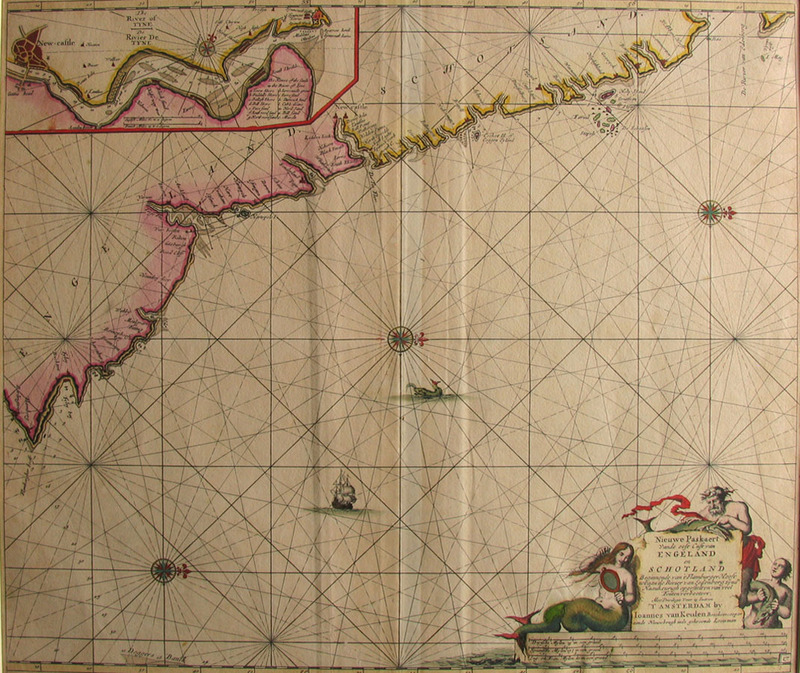 This chart of the North Sea was engrated by Geraerd Coeck in 1666 for a new atlas and replaced the equivalent Theunis Jacobsz plate purchased by Goos in 1650. First edition. 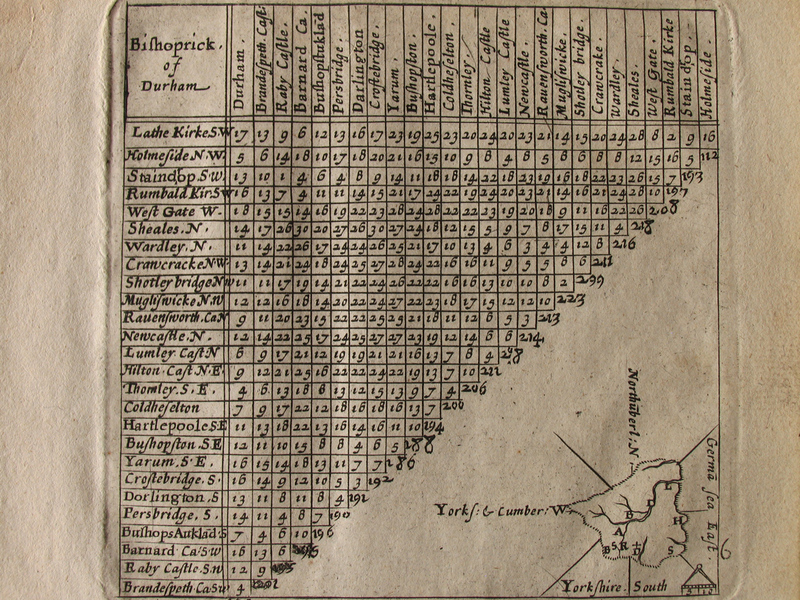 John Gibson 1759/80 from the “New and Accurate Maps of the Counties of England and Wales”. 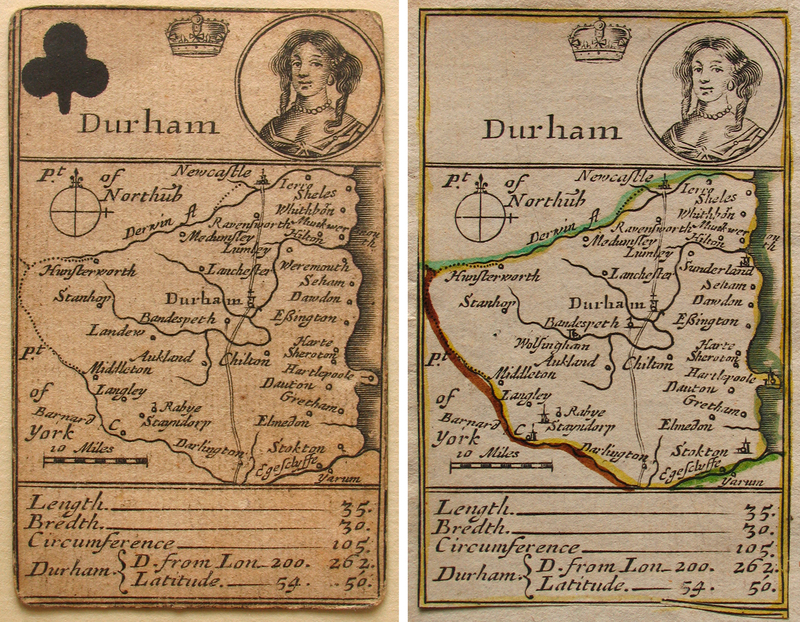 The maps were printed for a miniature atlas, first published by John Newbery, and later by Thomas Carnan. Pieter van den Keere/Speed 1617 from “An Epitome of William Camden’s Britannia”. 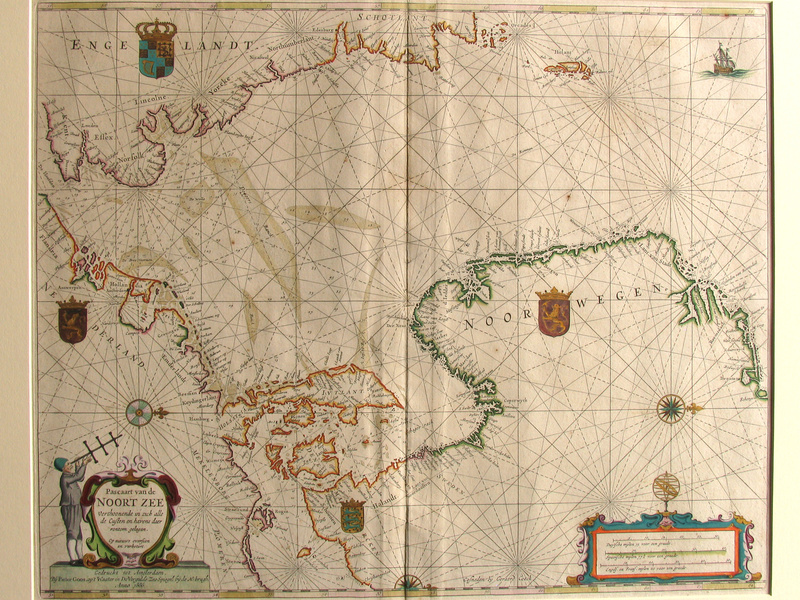 The 1617 map has no plae number, page 513 with Latin description verso. So-called “miniature Speed”. Johannes van Keulen c.1690 from “Zee-Fakkel”. 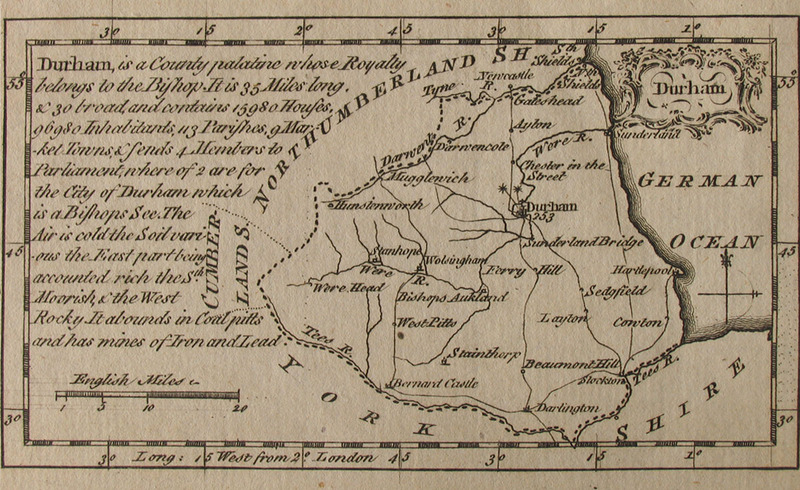 This chart of the North East coast has an inset of Newcastle (on Tyne). It can be seen to be an early edition with page number 17 at the lower right and it has little coastal information except by Flamborough Head and Holy Island. Jacob van Langeren 1636 from “A Direction for the English Traviller”. 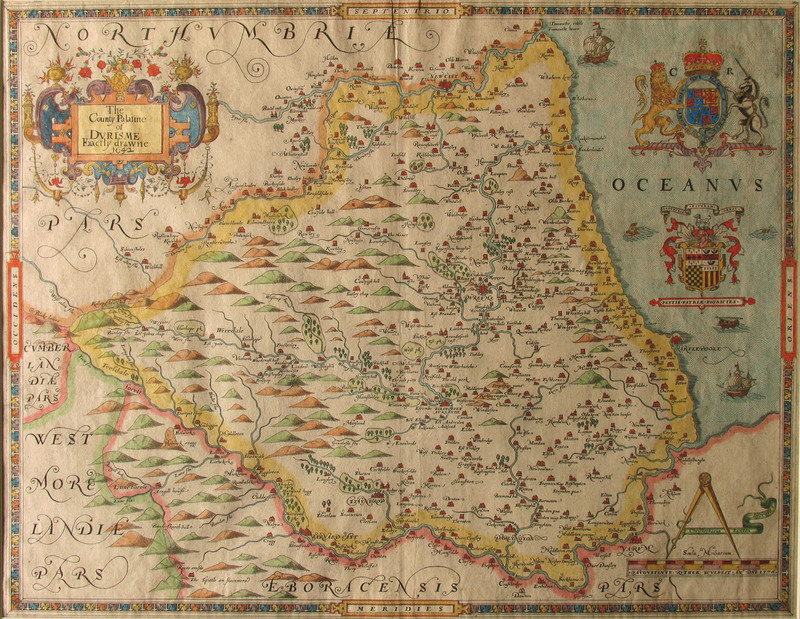 First published by Mathew Simmons, and this map is the second state with Plate 6 (at lower right) and mileages from London, diagonally. 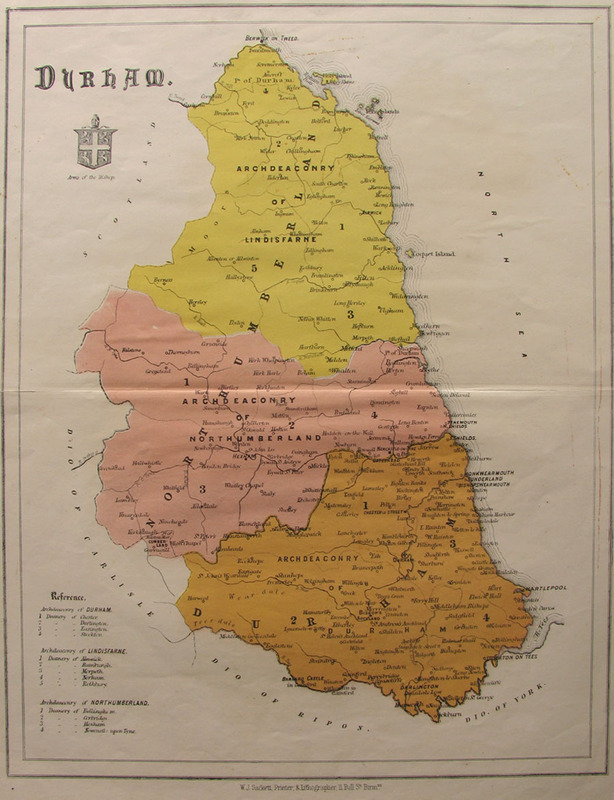 Printed with the so-called “thumbnail” map with alphabetic references in the narrative. W J Sackett 1864 from “A New Set of Diocesan Maps”. 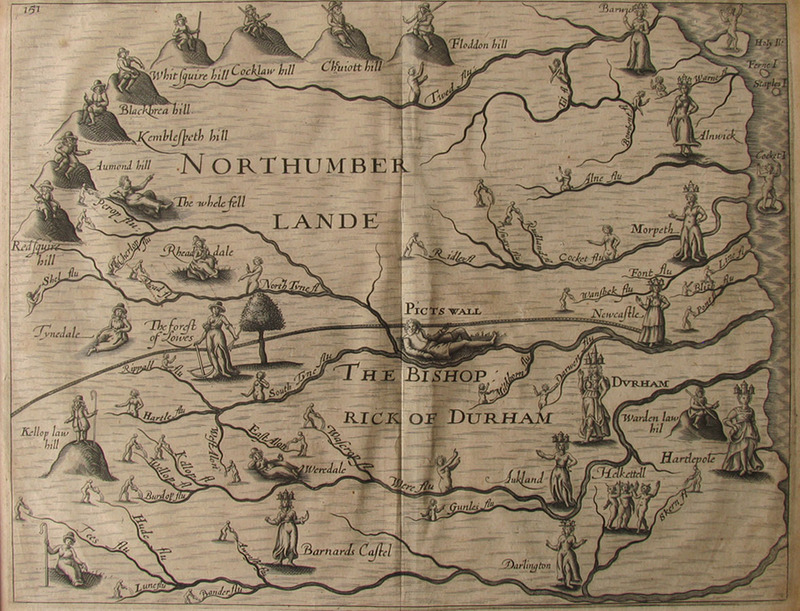 This is a map of the Diocese of Durham extending far beyond the county boundary, being part of a work by James Law, Prebendary, later Chancellor of Litchfield, assisted in completion by William Francis. It lists the Deaneries and Benefices on the reverse.